2018 is over and boy was it a crazy year! AI continued to show its strength in 2018, and certainly shows no signs of slowing as we make our way to 2019. 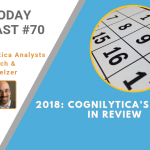 In this podcast Cognilytica analysts look back on the year and reflect on some of 2018’s biggest AI news, trends and use cases.